Its been quite sometime CoolPad Note 5 went up for sale on Amazon. We were using the phone for quite sometime now and here is our hands on review. The phone has got a lot many features with a price tag of Rs. 10,999 only. If you are looking for a budget phone with all the major features, probably you should have a look into this phone. It’s indeed a beast at this price. The Design is a premium one with Aluminium Unibody Metal Design and it has got invisible touch. The screen is 5.5 inch in width and it’s scratch resistant. It has got 8MP front facing camera alongside an LED flash, which should help in capturing photos, even in low light. The phone has got a very smooth finish and despite it’s 5.5 inch screen, you feel comfortable holding the phone. The main camera(i.e on the back), is 13MP and has got double flash LED following the shift in trends of smartphones. Along with that, there is a finger print scanner which remains on, even when the screen is turned off. The device is built on Android 6.0.1. It has got a custom interface called Cool UI. It’s certainly a great asset for the phone and there are a lot of options to explore in this. We have tested the camera at different lights and the performance has been pretty good. Of course there is a lot of room for improvement, but at this price we think this is certainly to the mark. Rear Camera comes at 13MP with dual LED flash which allows you to captures beautiful photos at even low lights. Camera settings are also interesting, you can switch switch resolutions between a 13MP 4:3 mode, 10MP 16:9 and a 10MP 1:1 mode. The front camera is 8MP with an LED flash which should capture good selfies even at low light, just like the rear camera. Battery life has became a crucial element to address before buying a smartphones these days due to the increased usage of mobile phone. CoolPad Note 5 comes with 4010mAh battery which lasts for about 2 days on regular usage and should easily last for a day when charged full at a higher usage. Budget phone with covering almost all the features for regular usage. Excellent display and sleek design. At this price, even the Camera is compelling. Final words: With a powerful 32GB ROM and a 4GB RAM, 13MP rear and 8MP front camera, custom Cool UI which provides a lot of options to customize, indeed a beast in hand. The phone is currently open for sale on Amazon at a price of just Rs. 10,999. Currently, it’s available in two colors, i.e Royal Gold and Space Grey. Visit Coolpad Note 5 official website for more details about the mobile. Click here to buy the beast. If we delete the most important stuff from our PC’s and tablets we can browse the deleted files from recycle bin, but when comes to the smartphones if you erase crucial files accidentally then we realize the importance of recycle bin feature. Do you ever wish to have Recycle bin feature on your smartphone and tried to install it? If you are one among those who are looking for this we have brought you two simple methods that will get you much-anticipated recycle bin feature on your smartphone. However, this feature is applicable only to the android users. This application is available on the Google Play Store which can be downloaded to your Android device and used as a Recycle Bin. This saves space on your phone. Backup and restore deleted data from the cloud, recover pictures videos apps and files directly from the cloud online. Your data is safe, easily backup and restore from the cloud to your phone with a tap. How to Make Use Of Dumpster? 1. Firstly, download and install the app on your Android smartphone. 2. When you launch the app for the first time, you’ll be welcomed with an agreement on your screen. Click on agree and proceed further. 3. Now browse the media files which you want to store in the app that got deleted from your storage. 4. Preview the deleted media from Dumpster. 5. Keep Your items organized in folders. 6. You can also schedule an automatic delete of old items. 7. For maximum privacy, you can restrict access to lock screen. For this you no need to root your device and even Internet connection is absolutely not required for Dumpster! ES File Explorer has lots of hidden features. One such feature is Recycle Bin. This is a full-featured file (Images, Music, Movies, Documents, app) manager for both local and networked use. This helps to manage your android phone and files efficiently and effectively and share files without data cost. If you have ES File Explorer on your smartphone, click on the Menu in the left sidebar if not download it from the google play store. 2. Enable the Recycle Bin Option. 3. Recover the deleted files if necessary by clicking on recycle bin option from the left sidebar. These are the two recycle bin features for your android smartphone. If you think it is essential for your smartphone, then download now. Every one of us likes to spend time with our friends, besties and family members. We would even call up on phone from a different number to someone among our friends and make fun of him talking like some other person (stranger). It would be so much fun to play pranks (especially prank calls) with your friends. What if I say you that android has something that you people want to make prank calls. Here are few amazing applications which possess the feature of letting you call your friends from a different number. Just imagine how would it feel when you call up randomly someone from your friend’s numbers and have fun. As you know that Prank Calls are those whose caller ID is not visible to us. There are many applications available on Google Play store that can do this for you. Note: This software is only for fun and prank purposes and must not be used for any illegal purposes as you can get tracked easily. With the help of these applications, you will need to fill your details and then hide them while making any prank call to any number. By using this app, you can easily fool your friends and have fun. No one expects to receive fake calls and that is why this kind of apps are best for playing pranks. This app allows making fake calls both to your friends and to yourself. It provides you with different voices in order to escape recognition. Fake-A-Call Free App comes in two versions. The paid one includes extra scripts and voices and shows no ads. So the free one is quite enough. Download it and make your first fake call. You’re surely gonna love it! This app can Auto-fill from your contacts, you can select your own ringtones, record voice on other end and schedule fake calls. This app allows you to make a fake incoming call from a virtual girlfriend to avoid awkward situations. This app isthe most professional and beautiful fake caller ID application. It can simulate a fake caller id to rescue yourself froman awkward situation. In this app, you can put any Caller Picture, Caller Name and Caller Number. You can also set a call time with given delays and especially you can set a Caller Voice. Fake Call 2 App allows you to record Caller Voice. This app allows you to make a fake incoming call from a virtual girlfriend to avoid awkward situations. This app is the most professional and beautiful fake caller ID application. It can simulate a fake caller id to rescue yourself from an awkward situation. In this app, you can put any Caller Picture, Caller Name and Caller Number. You can also set a call time with given delays and especially you can set a Caller Voice. Fake Call 2 App allows you to record Caller Voice. It simply cannot be excluded from this list, because it is one of the hilarious apps, that can make laugh anyone. This app is a mixture of making a fake call to someone and changing your voice into something hilarious. It doesn’t actually fake calls like those apps above, but you can use a different phone number to call from. This app provides you to easily change the pitch of your voice and the sound effect while on the phone. New users may be given some free minutes to test the app. You can buy more time from the app or earn free minutes. Well, it’s better to be careful with this app as it can bring hell out of anyone. People who fear more might throw your phone away and damage it, so play this prank on someone with good nerves. When your friend is using your phone, a terrifying picture will suddenly appear with a horrifying sound in the background. For this, you have to choose a horrifying picture and sound to set the time after which you want to scare your friend. There are many apps that people use to find your location and where are you going. With this app, there won’t be any chance of finding your location. It means you can easily fake your location with this app. Fake GPS Location Spoofer allows you to choose any place in the world and make your friends quite confused about it. It will overwrite your current proximity elegantly so that you can prank your friends on any social network to think you are somewhere else. Make sure you disable high accuracy location positioning/mobile locations under Android Location Settings and leave “GPS ONLY” or called “Device only” on some devices. Choose your faked location and press play. The app will insert the fake location into your android phone. Allow mock locations under Developer settings. Note: This app is provided “as is” and we cannot be held responsible for any usage by the end users of our app. This app is free with limited functionality and is for testing purposes only. Pranksters will think of something to fool people. Others will just have a good time with this app. This app offers more than 30 different effects which you can use to make your voice sound funny and make you laugh very hard. In this app, you can share your recordings with friends, save them to your phone. In this app, you have a chance of sharing the picture or video on WhatsApp, E-mail, Dropbox, etc. You can also create an image with sound and create a voice from text. Would you like to know the features which you have missed out? Here we have provided the hidden features from which you will definitely learn something new and you’ll find some fantastic features. know that there are actually some hidden features which are not known to us? The infrared beam emitted when a button is pressed will show as white or purple light in the viewfinder of your camera app. You can use this trick to check if a remote control’s batteries are dead when it stops working. The Easter egg game which is not known to the newcomers is quite similar to Developer Options trick and can be enjoyed in all Android versions. They’re hiding in plain site, in the software you use every day, and when you find them you’ll be delighted. Firstly open Settings page on your Android mobile phone or tablet. Now open “About Device” (or About Phone / About Tablet) section. In old Android versions, this section can be found at the bottom of the Settings page. In newer Android versions such as Android 4.4 KitKat, the “About Device” section has been moved to a new tab “More” in the Settings page. Once you open “About Device” section, look for “Android version” option. In newer smartphones, the “Android Version” option might present under “Software Info” section. Later you need to quickly tap on the “Android version” several times to enjoy Easter Egg. Tap as fast as you can and it’ll launch the secret Easter egg. This feature is available only on Marshmallow android and above. Go to Settings > Google > search and > now and tap. Now turn this feature on. This feature helps us to enhance google search. To view, this feature, follow these steps. Touch and hold the Home button. At the bottom of your screen, tap Select text. To select more words, drag the blue dots. Google will show you info about the text you selected. First, open the widgets on your device. Later you will see the notification. Click on “notification”. You now able to see the Notification shortcut on your device. If you would like to lock down your device so the person using it only has access to one app. This is the best feature which is available in latest android versions. Follow these simple steps to enable this feature. Scroll down until you find the Security option. Tap on it. At the bottom of the Security page tap on Screen pinning. Go to settings, and scroll to the very bottom. Until you reach ‘About Phone’. Once again scroll down to the very bottom until you see the ‘build number of your phone. Now tap this number of times until you get a small pop-up. The pop-up will say ‘ you are now a developer’. Now go back to the main settings menu and you will see a new option above about phone. If you’re not sure whether the process is complete you can try again and you will see this. Now the developer options are open. You can play around with features you understand. But this will 100% make your phone a bit faster. And smoother. Select the Language & input option. You’ll find the following option. Now, select the Gboard option followed by Theme option. You’ll find various options to set your keyboard as per your desired pic or color. Now, you know the Hidden features in the Android right? Use these and improve your experience day in and day out. Ever since Nokia Company said it’s going to make a comeback, there have been many rumors being spread about the company and its next Smartphone. One such rumor is that Nokia is going to launch its older handset 3310. Since then, the news has been trending that the Nokia was re-launching its legendary 3310 handsets at Mobile World Congress (MWC) next month. This news has now led to bush on the Internet. The Internet has been flooded with betraying images of what the New Nokia 3310 model Smartphone looks like. An online retailer from Kuwait has shared the images on the Internet, alleging that to be the upcoming Nokia 3310. However, the post has gone viral and since then, there are few videos on Youtube showing the features of the phone. The videos have also sprung up, trying to take in expectant consumers into showing what the new Nokia 3310 looks like. The Nokia 3310 hit the market in 2000, and had games like Snake II on it— a far cry from “Pokemon GO,” but still beloved. The phone may be of interest to people who want a second handset. After watching the video and pictures of the new Nokia 3310, don’t be fooled that the above shown are official. They are, just rumored pictures and the company has not revealed anything about the phone launch yet. According to Venturebeat, the expected launch price of the re-launched Nokia 3310 is going to be 59 Euros or just over Rs 4,000. But that’s all we know for now. There has been no official teaser from Nokia on just what the new 3310 will look like. Don’t fall for these tricks just yet. Google’s Android keyboard now has many more themes to pick from, and they’re not as drab as the “material dark” and “material light” options that existed before. With the new version that just hit the Play Store, you’ve also got a slew of options in shades of red, blue, green, pink, and yeah.. some more black / gray options too. Themes are already available to people running the Android N preview, but now you won’t have to run beta software to get ’em. And if none of the colors suit you, you can also choose an image from your camera roll to go behind the keys. The latest, theme-filled update for Google Keyboard — version 5.1 — is available from the Play Store now. And hey, this is one thing Google’s iOS keyboard doesn’t (yet) do. Android is now almost everywhere in the tech world. Whether you look at some smartphones or tablets, or smartwatches or even in-dash entertainment systems, Android is available behind the scenes to deliver a smarter experience. One of the reasons for its huge success is the ease of its development. Presently, Google Play Store holds over 2.2 million apps for Android devices. This data is enough to make Google’s platform the leading mobile operating system, followed by Apple’s iOS and Microsoft’s Windows Phone. Also, this gives you a reason to opt for Android development — without any second thought. Therefore, we are here covering five tools that will help you transform into an Android developer. These tools will enable you to create some big apps for the open source platform and gain popularity through your developments. Android Studio is the official integrated development environment (IDE) for Android that Google launched back in 2013. It has Virtual Device Manager to enable live testing experience without the need for any physical device. But if you’ve connected to an Android device, you can debug your apps instantly using the Android Virtual Device Manager. To offer a multi-platform experience, Google has designed its Java-powered Android Studio for Windows, Mac OS X and Linux. It supports Android Wear app development in addition to native Android apps. Further, there is an option to integration Google Cloud Messaging and App Engine using the built-in Google Cloud Platform access to uplift the end-user experience. Android NDK (Native Developer Kit) offers a set of tools that allow you to leverage C and C++ code for developing Android apps. The tools come with some existing prebuilt libraries to let you reuse the previous codes and make some innovating offerings. Google’s aim with the release of Android NDK is to influence C and C++ developers to enhance the number of Android apps. Thus, you don’t need to be a master of Java to develop something for Android users. You can also utilise some third-party solutions to integrate the NDK into Eclipse IDE or Microsoft’s Visual Studio. If you want to develop an app with 3D experience, you can use Unity3D. This tool offers you a bunch of proprietary APIs that help in enabling attractive interfaces for a variety of Android devices. Additionally, you can utilise some high-end features of the engine to develop 3D mobile games. Written with codes in C and C++, Unity3D allows you to develop apps and games in C#. You can additionally take help from some photo-editing software like Adobe Photoshop or Autodesk Maya and design textures as well as shadows for your creations. For programmers with the knowledge of C++ and QML, the Qt Company has designed Qt for Android. This framework allows you to develop Qt 5 apps on devices with Android 4.1 (API level 16) or above. Additionally, it provides you with some simple solutions to handle multimedia content and extract readings from various sensors. Once the coding work is accomplished successfully, Qt for Android lets you create and deploy Android’s Application Package (APK) through Qt Creator. The framework requires Android Studio and NDK to accomplish your developments. Microsoft is ironically supporting Android app development using Xamarin. This is one of the youngest tools and perhaps the easiest one to develop not just Android but also new iOS and Windows apps. Xamarin uses C# language to design your Android apps. Microsoft recently announced the open source availability of Xamarin SDKs that include Mono runtime ports and command-line build tools to support the community. More than a million developers are already using Xamarin around the world. This makes sense why you should opt for this solution. So these were the tools that you can use today to fillip your presence in the ever-growing world of Android. However, you still need some knowledge about how to code to kick-start your developments. It’s fair to say the success of the ARM-powered Raspberry Pi computers have surpassed expectations and have been a godsend to hobbyists, hackers, and students. If you’re one of those people looking for unofficial hacks to install Android OS on a Raspberry Pi device, then stop and wait for the official release. Raspberry Pi computers have largely been Linux affairs, as several Linux distributions have supported this tiny ARM computer. Now, it seems like Raspberry Pi is ready to get official support for one of the most popular mobile operating systems out there: Android. 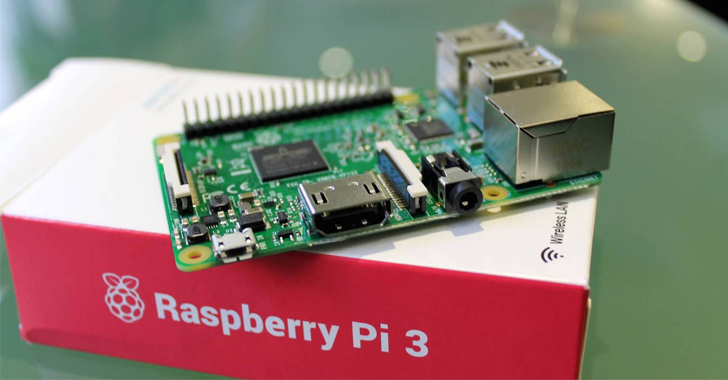 Google has recently registered the $35 Raspberry Pi 3 ‒ the newest version of the Raspberry Pi ‒ as a new device ‘tree’ in its Android Open Source Project (AOSP) repository. If you’re not aware, Raspberry Pi is cheap, credit card-sized, single board ARM computer that looks and feels very basic, but could be built into many geeky projects. What Google is planning for Android and the Pi is unclear. However, once released, Android support for Raspberry Pi 3 would give programmers access to more than 1.5 million apps, allowing them to mess around with their own custom projects too. Last year at Google I/O developer conference, the company, announced Brillo OS, a lightweight Android-based operating system for low-power devices built on ARM or Intel i.e. the Internet of Things (IoT). Arduino is an Open Source, single-microcontroller electronics prototyping board with easy-to-use hardware and software. It was developed in 2005 by Massimo Banzi and David Cuartielles. Arduino is capable of interacting with the environment by receiving inputs from a broad range of sensors and responding by sending outputs to various actuators. The Arduino board consists of 8-bit Atmel AVR microcontrollers. In addition, the board has a standard way of connecting the CPU with various other complementary components to increase its functionality through a number of add-ons called shields. You can either assemble an Arduino board yourself or purchase it (pre-assembled) from http://arduino.cc/en/Main depending on your needs. The microcontroller on the Arduino board is programmed via Arduino Programming Language (based on Wiring) and Arduino Development Environment (based on Processing). The Open Source Arduino environment can be downloaded for Windows, Linux or Mac OS X from http://arduino.cc/en/Main/Software and extracted. This makes writing the code and uploading it to the board very easy. As the environment is written in Java, make sure you have Java installed. Once you’ve typed in the code, connect your board via USB, and upload the program to it. As the LED has polarity, you need to fix it onto the board carefully. The long leg, typically positive, should be connected to pin 13, and the short leg to GND (i.e., ground). The LED starts turning ‘on’ and ‘off’ at intervals of one second, as shown in Fig. 1. To connect your Arduino board to an Android device, you need an Amarino toolkit. Amarino is a project developed at MIT to connect Arduino and Android via Bluetooth. It has been released under GNU GPL v3. You can download these toolkit components from http://code.google.com/p/amarino/downloads/list. Moving on, if you want to work with Amarino, you need an Android-powered device running version 2.x, though it supports version 1.6 too. Moving on to the Arduino board, you can have a Lilypad or Duemilanove, with a Bluetooth shield such as BlueSMiRF Gold and Bluetooth Mate, or an Arduino BT, which comes with Bluetooth attached to it already. Installing Amarino is simple. After you’ve downloaded ‘MeetAndroid’ library, extract and copy it to ‘Arduino Libraries’ directory. 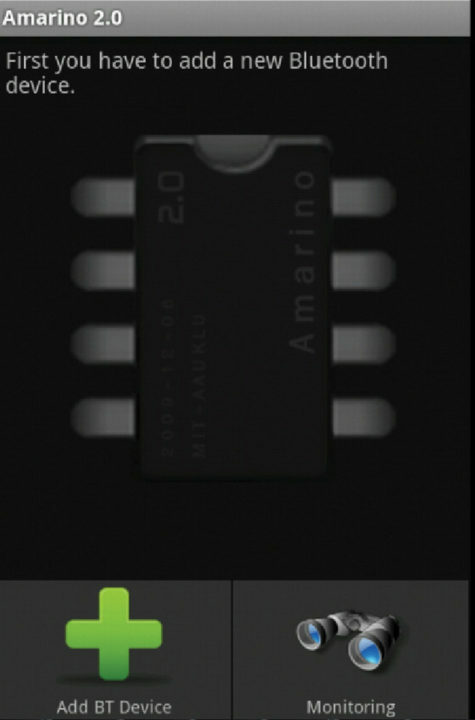 Install ‘Amarino.apk’ package to your Android device by downloading directly to it or by calling ‘adb install Amarino.apk.’ Make sure your device is connected to the computer via USB, and the PATH is set correctly for ‘Android SDK Tools’ directory. 1. Authentication. Open the installed Amarino application and click ‘Add BT Device’ to search for your Arduino BT device. Make sure that it is turned on. But before the two can talk to each other, they must be authenticated. Select the device and confirm pairing with it from the notification bar. Typically, the pin number is 1234, 12345 or 0000. Once your Arduino BT device is authenticated, it’s ready to go. See Fig. 2. 2. Creating events. Next, install the plug-in bundle (AmarinoPluginBundle.apk) from http://code.google.com/p/amarino/downloads/list. Thereafter you can head to event creation. Start the Amarino application and launch ‘Event Manager’ of your Arduino BT device. Click ‘Add Event→Test Event.’ This is a test event—a demo that sends a random number (0-255) every three seconds. Now your Android device is ready to communicate with the Arduino board, so set up the latter. 3. Setting up Arduino. Open your Arduino software and select ‘File→Examples→MeetAndroid→Test.’ When the project opens, change the baud rate of your Bluetooth module from 57600 to 9600, as highlighted in Fig. 3. Upload the sketch to the board. If there is no LED on the board, you can attach one to pin 13. Now your Android device and Arduino board are ready to talk to each other. In the Amarino application on your Android device, click ‘Connect’ to communicate with the Arduino board. 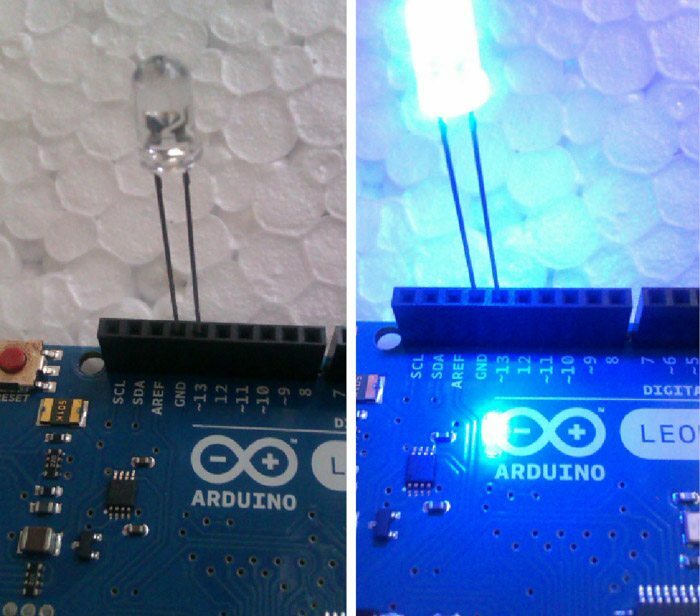 As soon as Android connects to Arduino, it starts sending a random number every three seconds, and that lights the LED for one second. You can monitor the process by pressing ‘Monitoring’ on the main screen of the application. 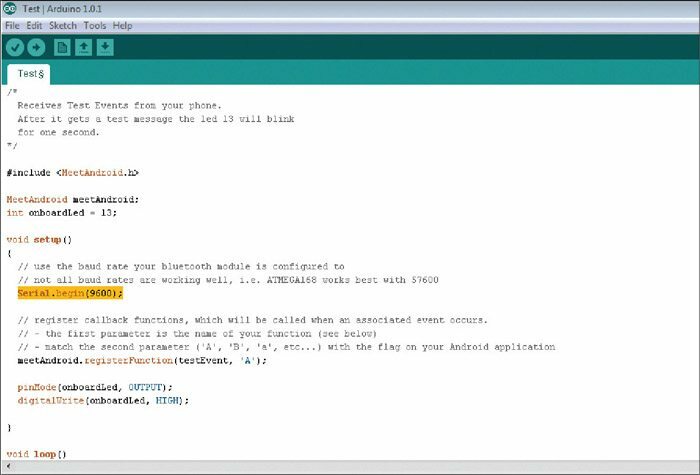 This concept of connecting Android to Arduino can be very handy in making electronics projects more useful by increasing their flexibility. It can easily be used in home automation controls, power consumption meters, Bluetooth-controlled robots, managing devices from the computer and much more. There is little doubt that Amarino brings us more power by helping us connect Arduino with Android.